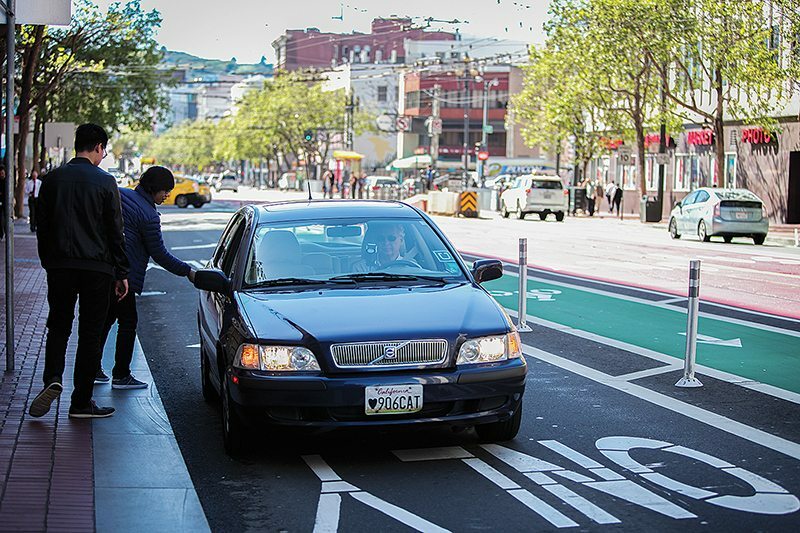 Recent reports out of San Francisco and New York City find that ride-hailing companies like Lyft and Uber are contributing to increased traffic congestion and could be hurting transit ridership. The San Francisco study found that ride-hailing vehicles travel approximately 570,000 miles within city limits on a typical weekday. This accounts for 20 percent of all local daily vehicle miles traveled (VMT) and includes both in-service and out-of-service mileage. Ride-hailing trips are concentrated in the densest and most congested parts of San Francisco, including along major public transit lines, and operated extensively on neighborhood streets. The study authors worked with researchers from Northeastern University to develop software that collected data from the Lyft and Uber applications over time, a work-around due to the lack of publicly available data. Limited public access to trip data makes analysis like this difficult in cities across the country that are experiencing tremendous ride-hailing growth, including Chicago. The New York City report was based on trip and mileage data that are uniquely available in New York City, providing the most detailed and comprehensive assessment of these new services in any U.S. city. The study found ride-hailing companies added 600 million miles of driving to city streets in 2016, more than the total yellow cab mileage in Manhattan. Trip growth in Manhattan has been concentrated during the morning and evening peak periods. Ride-hailing growth in New York City has accelerated since 2013, while subway and bus ridership began to decline. Replicating this analysis in Chicago is difficult because ride-hailing companies aren’t required to make trip data publicly available. Due to issues of geometry, cost and equity, it’s unlikely ride-hailing will ever replace public transit in dense urban environments. Still, the growing popularity of Lyft and Uber may be increasing congestion locally and could be contributing to the recent decline in bus ridership. More data and analysis is needed to more definitely answer these questions in Chicago. Stay tuned for more on ride hailing in our upcoming Speeding Up Chicago’s Buses report this fall, supported by our partner TransitCenter, which analyzes the trends of declining bus ridership, what’s contributing to it and what can be done to get people back on the bus.